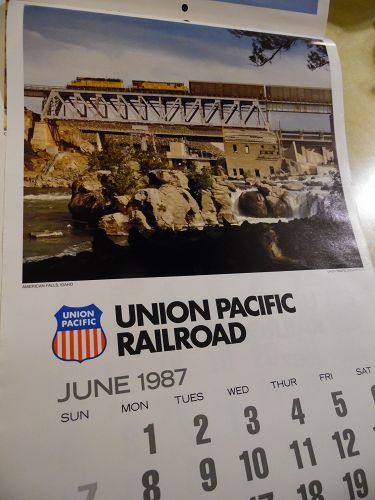 "1987 ~ UNION PACIFIC RAILROAD CALENDAR ~"1987 (1)..vintage..Union Pacific..1987..Six page..flip over.."vintage"..size..(12 1/2"x 23").This is a calendar with very little issues which does not effect any of the pictures. Not every picture has a train incorperated into the picture, only a few. January Mt Hood Oregon, February Lake tahoe Nevada, March Guadalupe Mountains national Park, April trains on Williams Loop feather River Canyon California, May Cypress Lake at Layfayette Louisiana, June Train on trestle American Falls, Idaho, July Train near Lookout Wyoming, August High Catte Country Colorado, September Near Cotter Arkansas, October Near Carthage Missouri, November Great Salt Lake Utah, Dec Winter in Nebraska, Guaranteed to be Old & Original & Genuine!. No tears or repairs. Only one picture here of the photo's and the calender is longer than photo and complete.